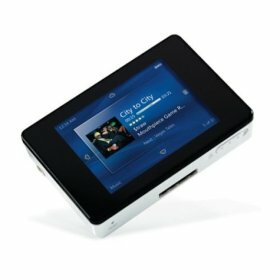 iRiver Clix (CXW-2G) is a 2 GB ultra compact digital music and video player that features 2.2-inch vivid color LCD display with 320 x 240 QVGA resolution and direct-click touchscreen control. iRiver Clix supports playback for music, video, photos, or downloadable games for MP3, WMA, ASF, Ogg, JPEG, MPEG-4, and Flash Lite 1.1 files, plus Windows Media Player 10 and various online music stores and subscription services, including PlaysForSure services such as Napster and Rhapsody. iRiver Clix also has built-in microphone as dictation machine, built-in FM tuner, 10 EQ settings and SRS WOW sound. CNet gives excellent rating of 8.7 out of 10 and concludes that the iRiver Clix is a superbly designed MP3 player that’s easy to use and packed with pretty much every feature in the book. If you’re looking for a stylish Janus-compatible device and you don’t need a boatload of storage, this is your player. Good points are sleek and stylish, the iRiver Clix offers a unique, intuitive interface and comes with extras such as an FM radio, a voice recorder, an alarm clock, support for OGG files and subscription content, and photo, video, and text viewing. The Clix includes SRS Wow sound effects, it has good battery life, and it’s priced competitively. While bad points are iRiver Clix’s ample screen is a magnet for fingerprints, and the device maxes out at only 2GB. The cool and useful cradle is sold separately.